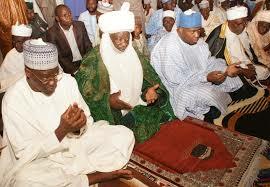 Saraki, Sulu-Gambari worship at llorin Eid praying ground – Royal Times of Nigeria. The Senate President, Dr Bukola Saraki, the Speaker of the Kwara House of Assembly, Dr Ali Ahmad and the Emir of Ilorin Alhaji lbrahim Sulu-Gambari were among other dignitaries who performed the two rakaat prayer commemorating the Eid el-kabir Festival in llorin. The prayer which lasted less than ten minutes amidst tight security was led by the Chief lmam of llorin, Alhaji Abdullahi AbdulHamned. The Chief Imam in his sermon urged Muslims to use the Sallah occasion to show love, promote harmonious and peaceful co-existence with one another, irrespective of ethnic or religious affiliation. In his message, the emir of Ilorin, Alhaji Ibrahim Sulu-Gambari charged Muslims to sustain the relative peace and harmony the state is known for at all times and be security conscious at all times. On the proposed International Durbar of the llorin emirate slated for Wednesday in llorin, the Emir said the celebration is to strengthen unity and love amongst the people of the emirate and the state in general. Sulu-Gambari implored the people of the state to come out enmass to grace the occasion and be law abiding before, during and after the celebration. The Emir also prayed for the safe return of those performing the 2018 Hajj in Holy land.